Paula is just one of many unusual women in her family. Ever studious and sharp, she's earned the privilege of accompanying her merchant father from their home in Transylvania to Istanbul as his assistant in search of a rare and precious artifact, Cybele's Gift. But once in Istanbul, Paula and her father learn that their contact there has been murdered—and his knowledge of Cybele's Gift may be the reason. Paula must now assist her father in rather unconventional ways—from making friends with scholars and a pirate to listening to gossip—in order to discover the location of the artifact. But she and her father aren't the only ones who aim to acquire Cybele's Gift, and as each day brings them closer to the thing which they seek, it also brings them closer to peril. The most remarkable thing about Juliet Marillier's writing is her seemingly natural knack for not only telling an engaging and wonderful story, but for incorporating fascinating (and educational!) glimpses into whole new cultures. Istanbul comes positively alive in Cybele's Secret, both the exotic and other less favorable aspects of the life—like the oppression of women. Paula, who readers were first introduced to in Wildwood Dancing as a quiet, intellectual, and serious girl, shines in this novel as a young women who is passionate, intelligent, and savvy. She is not without her faults though—her eagerness and refusal to accept a lower station in a world where women have no pull are admirable and often get her in scrapes that will delight readers and cause suspense. The plot itself moves rather slowly in the beginning, but many readers won't mind as Marillier exposes the exotic setting and lays the groundwork for action. Though The Other Kingdom and magic is not as present in Cybele's Secret as it was in Wildwood Dancing, Paula is haunted by images of her eldest sister and ominous feelings of magic underfoot, which doesn't reveal itself until the fast paced and riveting end. 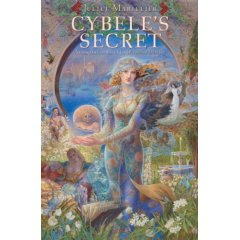 Full of witty banter, culture, adventure, strong heroines, a touch of romance, and just the right amount of magic, Cybele's Secret is an incredibly smart and complex tale that just might trump its prequel. A content ending with a peek into old characters' lives and just the right amount of foreshadowing will leave readers anticipating another book centered around the remarkable sisters who once danced in The Other Kingdom. On a side note: I am absolutely in love with the cover! Kinuko Y. Craft is the artist, and she did Wildwood Dancing as well, along with the covers from Simon Pulse's Once Upon a Time...series. Detail is most definitely her forte...I could spend hours simply examining her covers! This one does look good! I've always wanted to go to Istanbul - I've been to Turkey, but only on a day trip to Ephesus from a Greek island. I really really want to read this book! I read Wildwood Dancing and loved it! Sounds interesting. Have you read Wildwood Dancing? If so, I'm curious what you thought of it. Thanks for the review! Oooh, this is one I really want to read. I loved Wildwood Dancing. Interesting that you mention that the plot of this one moves slowly in the beginning, because I thought the same thing about Wildwood Dancing. But it managed to catch my interest, and then I couldn't put it down. Looking forward to reading the sequel. I agree about the covers. They're lush and gorgeous. Definitely a great series! I hope JM writes about Stela next! I love the cover too! The detail never ceases to blow me away. I loved Wildwood Dancing and I've wanted to read Cybele's Secret! It looks so good and I'll bet is it just as brillantly written as her other books. The cover of this book is sooo gorgeous! !